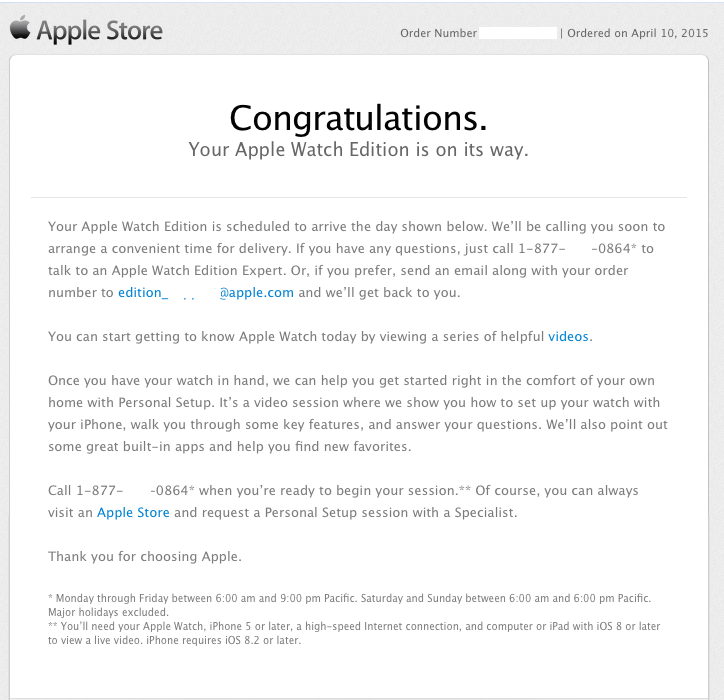 Today, I received my shipping confirmation for the Apple Watch Edition. I ordered the $17,000 gold 38mm Apple Watch with a Red Modern Buckle on April 10th and got a May delivery date. The gold Watch will arrive on Friday, May 29th. While it is late late March, Apple fulfilled it’s delivery date promise. After I received the shipping confirmation, an Apple Watch Edition specialist contacted me by phone to confirm all the delivery details. The Edition team allows customers to choose specified a specified date, time, and location for the delivery to take place. Also, they inform customers of the business casual clothing the courier will be wearing at the time of the delivery. After the Watch is delivered, customers can call the Edition team for a personal setup in the comfort of their own home. Overall, the Apple Watch Edition team offers an increased customer service experience than Apple’s regular sales team by offering clear and personalized service.